Something happened after I stripped and re-stained the buffet in the living room. After a few weeks, I started missing the red. Not the red on the buffet itself, but just the color red in general. Apparently, not only are my beloved colors kelly green and navy, but also a bold red. This really isn’t surprising. Red was always my favorite color growing up. I’m quite sure it became my favorite color when Reba wore the red dress. If you know the dress I’m talking about, then we are kindred spirits. So I started hunting for something to paint red. Que Lorrie Morgan’s Something in Red. Sorry, I’m not quite sure how this post has become about country music of the 90’s. And I happened upon my great-grandmother’s china cabinet turned liquor cabinet. I know. I know. You can judge me. It won’t bother me at all. And not just a change in color, but also a change in location. I know, right. It went from flat black to vivid red. It also moved from the dining room to the back corner in the living room. Before doing anything, I took off all the hardware, including the “campaign” corners that I had added to the piece a while back. I used wood filler to fill the holes and then sanded it smooth when dry (there’s a full tutorial here about filling holes). After that, I wiped the whole piece down with Ready to pick up any dirt and dust, then taped off the glass with FrogTape. This piece is so heavy that I painted it right there in the living room. Moving it from the dining room to the living room was a job, so once it was there – it stayed. For that reason, I also taped off the flooring around the cabinet. After the prep work was done, which wasn’t much at all, I started painting the piece Vivid. Vivid is a true red hue from Velvet Finishes. It took about four good coats to even out the red. 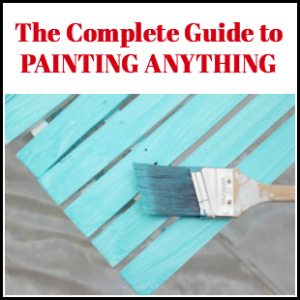 If you have painted anything red before, you know it takes a while to even out the color. At my old house, I put eight, nope, not kidding, eight coats of red paint on the kitchen walls before the color evened out. Luckily, this paint didn’t require near as many coats. After the paint was good and dry, I went back over the piece with Protect. Protect is a satin poly topcoat. Velvet Finishes already has a topcoat built in, but this piece takes a good beating seeing as how we like our drinks around here, so I gave it some added protection. While the Protect was drying, I painted the O’verlays. That’s the Jenna definition anyway. Really though, they are super cool. There are tons of designs to choose from and you can have them custom sized for your furniture. If you want to makeover an IKEA piece, they already have panels for those pieces sized and ready to go. How cool is that? I went with the Cheryle panels. They came to me primed white. I had toyed with the idea of leaving them white against the red, but in the end, gold won out. I gave them a few coats of gold spray paint. 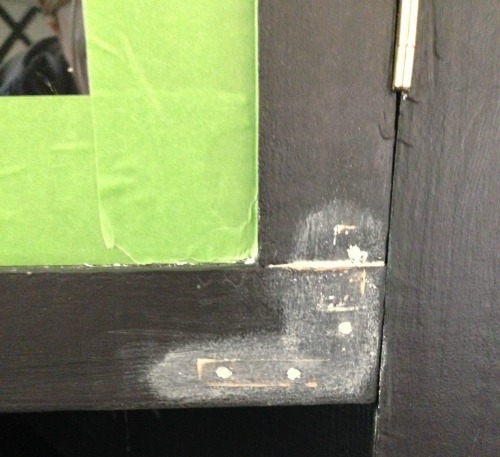 Once the panels and cabinet were fully dry, I used my nail gun to attach the panels to the lower cabinet doors. You could also use a glue as well. The top panels went behind the glass. I used these panel clips to keep them in place. Its vivid, its bold, and I love it. I kept the lion hardware, but I have to say, I think it pops so much more with the red and gold fretwork than it did before. And the fretwork? 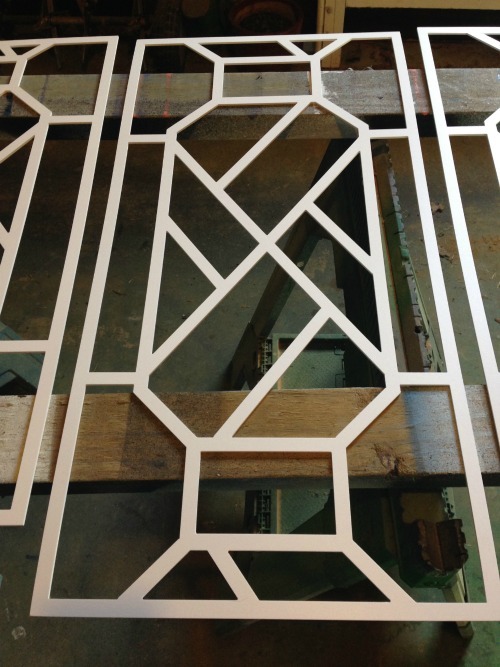 Ahhh, the fretwork – well that was just the icing on the cake, darlin’. So tell me, are you seeing red now? The good kind? Do you have any furniture that needs a facelift? Disclosure: This post was a collaboration with Velvet Finishes and O’verlays. However, all opinions and references to 90’s country music are 100% mine. JENNA! This makeover may be my favorite Velvet Finishes flip! I love seeing what you create next, so fun! Really, Amy?! Wow, that’s a huge compliment!!! Thank you! 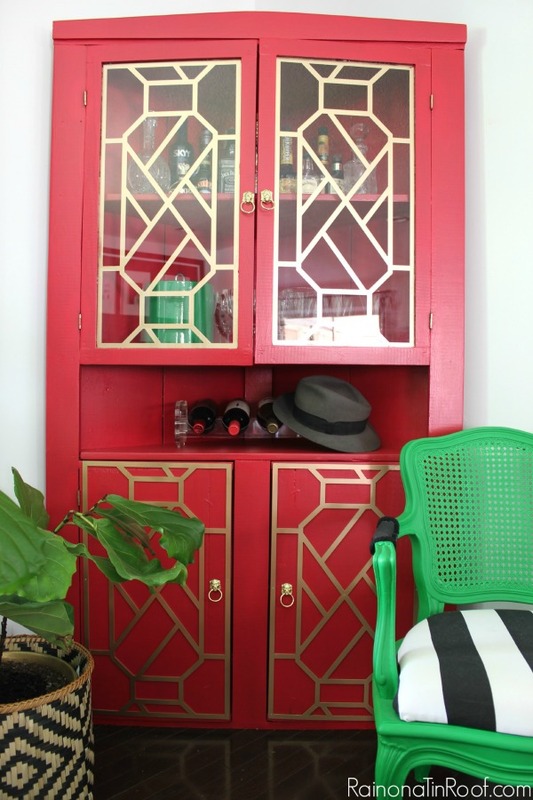 I’m inspired by this post to refinish a corner cabinet in our dining room in a fun color! Love this!! I’ve been keeping my eyes out for a dining room hutch that I can paint with Velvet Finishes! I have a couple of nightstands i’d like to try it on! I just bought a large hutch at an garage sale and I’d use it on this. I’m new to Velvet Finishes but looking to paint some furniture for our new house! The red looks awesome! I’d use this on a coffee table that I was planning on painting over . I love Velvet Finishes paint! I’ve used it in the past and it is the easiest paint to use, in my opinion. I’ve never used the overlays, but I have a project waiting in the wings! 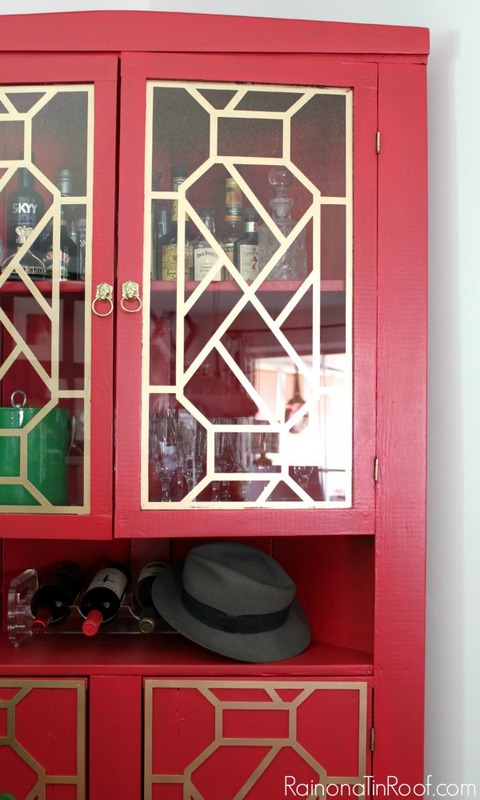 Love the color and the overlays make the cabinet, perfect! I have heard so many great things about this paint. I can’t wait to try it! 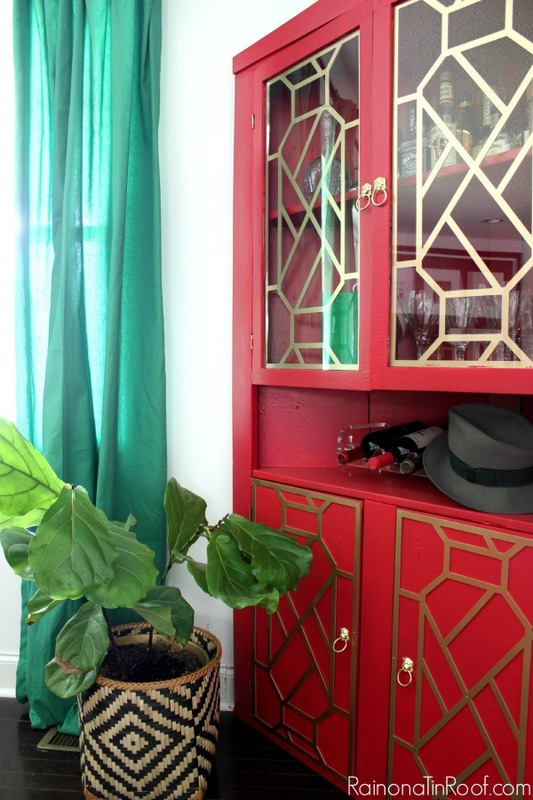 I would soo love to win the Velvet Finishes paint – I’m in love with the red color you used and I have the perfect piece I’ve been wanting to paint red. And I know the O’verlays would go great on it too! I can’t wait to use Velvet Finishes on my entry hall table and O’verlays on my Ikea Lack chest! Every single centimeter is you! I would know your work anywhere I truly believe that!! 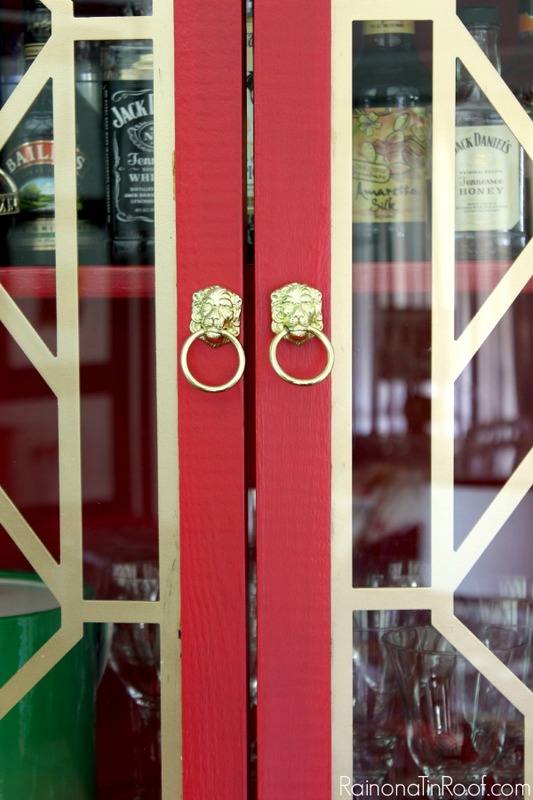 Love this red dressed liquor cabinet! And your right, fret is icing on the cake! I could so use this. 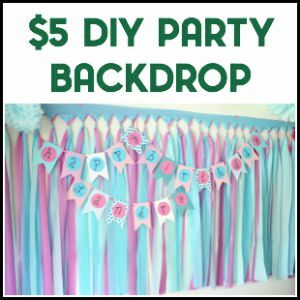 I’m a DIY person, and I constantly have a project going on. I would use Velvet Finishes and O’verlays on any one of the several “found” furniture pieces that are waiting patiently in my garage for their make-overs. I have a hutch that is in desperate need of a makeover!!! I love the makeovers you did. I have a cabinet up in the attic that I would do over. It was an old closet they used in the back bedroom. I also have bought some used furniture at yard sales and thrift shops that would look amazing after I used this on them. Jenna this looks absolutely beautiful ! I would love to paint a pair of old tall bookcases I have, maybe add doors on the lower half and add the O’verlays. Hmmm…now you’ve got me thinking! I would use them on my cabinet in the dining room. On a new (old) hutch I just bought. I love red. I have a shoe stand in my bedroom that I’d like to paint red. It will look great against the lime green paint/red combo in the room’s fabrics. Love this! I would use O’verlays and Velvet Finish on an Ikea dresser. I would love to use this on my mid century cabinet/room divider! It matches the train car we love in too!!!! I have a cabinet that I would use this on. Love the red and the gold overlays made it pop. Beautiful job! I’m just about to be able to pull my grandma’s old table out of storage to use in our house. It is the table I grew up doing homework on and eating her home cooking. When I had it in my old house my kids did everything at that table. I think she would approve if I spruced it up a little and gave it some love! That’s awesome! I actually made my grandparent’s old kitchen table into my desk and I love working at it everyday – good memories! Fabulous!! I would use them on my bookcase with glassdoors. I so need to paint my secretary desk….love this. Red has aways been my favorite color. I love the cabinet. I would use it on my new, vintage kitchen table. Looked on the O’verlay website – love how you used those on the red bar. Was this a custom order? Thanks. The pattern wasn’t custom, but the size was custom, Elaine. This piece is probably close – if not already – 100 years old, so the measurements were very specific. I absolutely love your makeover! It looks so perfect in red it’s hard to imagine it any other way. I had never heard of Velvet finishes before but after seeing how beautiful your cabinet came out I am itching to get my hands on some! 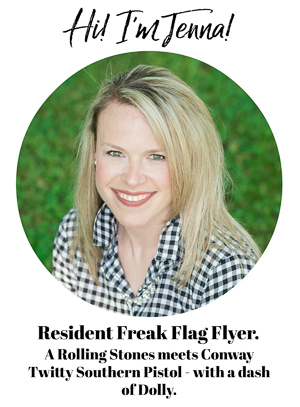 Love your bold style not to mention your dry humor..would love to have a bourbon and water with you sometime! Have a great weekend! Thanks, Kathy!! Oooooo….I love me some bourbon! I will use it on a nice table… This is such a beautiful color. I love the Overlays! I didn’t know you could get them in custom sizes?! 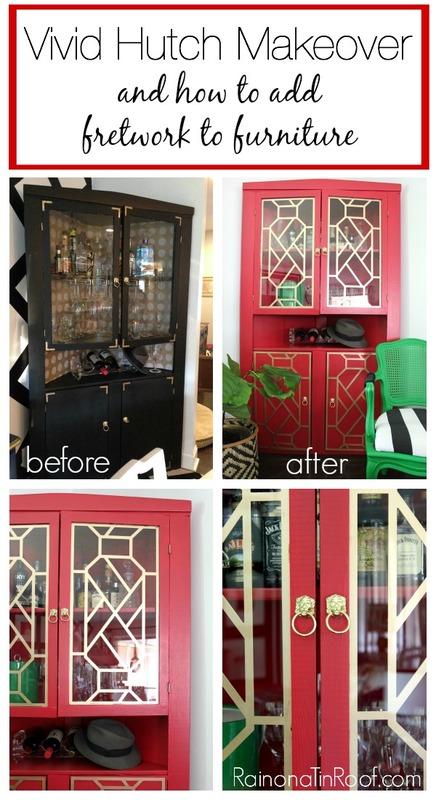 I would totally use for my dresser makeover! Red just isn’t my cup of tea. Wow girl you did it again! Love the color and the accents. I would say this is going on my Jenna favorites list But I don’t have one because I love them all! They are all my favorites! You come up with beautiful, inspiring, creative ideas. Keep them coming! Thank you for the giveaway & the chance to win. I have a dull dresser with twin mirrors that would look fabulous done like this. Thank you again & God bless. Oh Glenda!! Thank you! You are totally boosting my ego way too much over here! My daughter wants her dresser repainted a darker color. SO I’d love to try this paint as it already havs the sealer in it too! I would use it on a bar that I want to refinish for the basement. 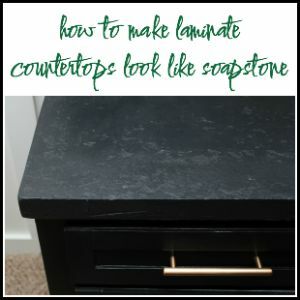 I would paint my Kitchen Island and use the overlays on the sides of it! This piece looks amazing!!!!! I’ve been toying with the overlays idea after seeing them on GMA! You’ve inspired me to pull the trigger! Go for it, Marci! Your’s will be awesome! I would use it on a sofa table that I am wanting to fix up! I love this! I’m dieing to try O’verlays now that I’ve seen your makeover. I have a garage full of furniture treasure from tag sales. 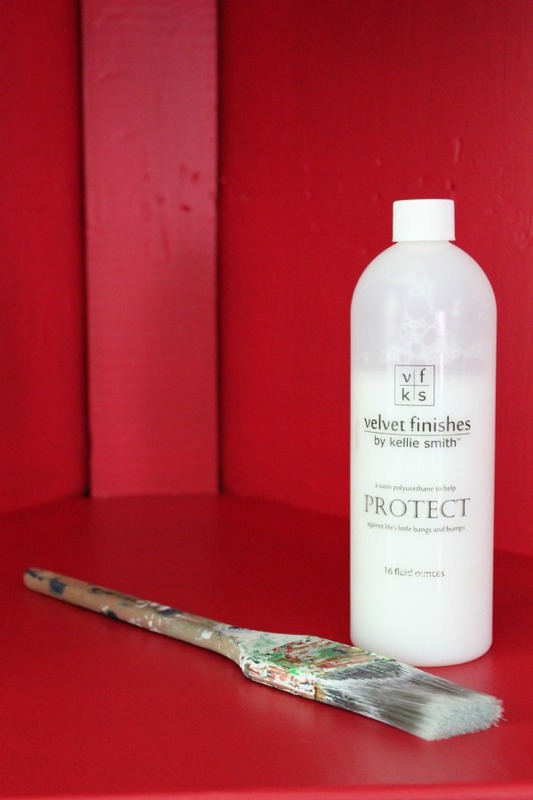 I’d love to try Velvet Finish products too. (Especially after seeing your post on using any color mixed with the glaze!!). I’m a huge fan of red too! I would user it on a headboard imm in the process of re doing. I just bought a really old pie safe literally in a barn at an estate sale! They had one that looked pretty nice inside but I found the old broken down one in the barn that appealed to me! I would use the paint to bring it back to life and it’s prior glory!! It could be beautiful. I have 2 old bedraggled end tables that I bought over 15 years ago from a friend that was moving out of state. They are sturdy, but that is about as much as you can say for them. I think they need a makeover! I have a crazy-ambitious project that involves turning an old drawer into a train table for my kids. I think I would use this on that. AWE-SOME!!!!!!! The Velvet Red is just simply to die for!!! I want to redo end tables that just do not need to exist in their current lack of pizazz state! I think the red would look great — um — but maybe a good turquoise/teal would too — any suggestions for THAT color, Jenna? 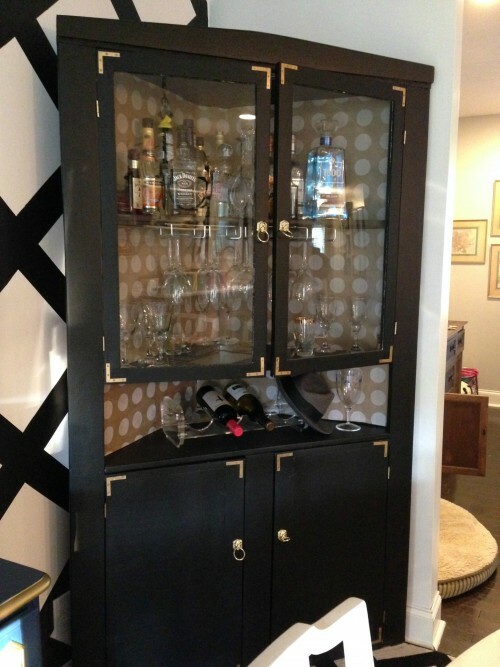 LOVE what you did for the liquor cabinet when it was matte black, but, the RED is just AWE-SOME!!!! Thanks, Marti!! Velvet Finishes has a color called Boheme and it is a beautiful turquoise / teal color! I have a chest of drawers I would use the Velvet Finish on. For redoing bed stands that I find at local thrift stoors! I have a bookshelf that I want to redo! 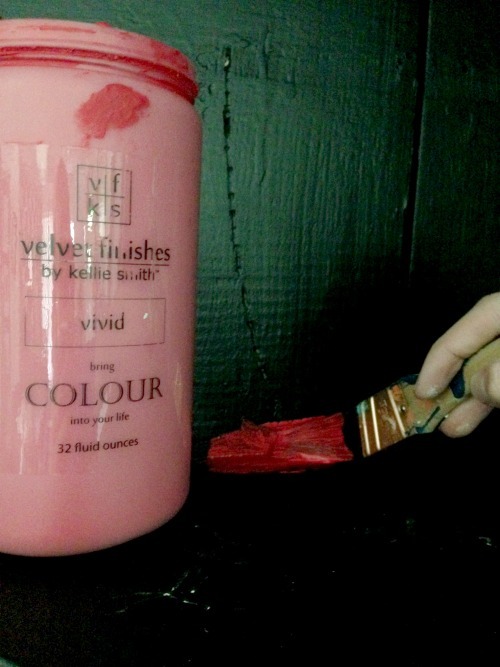 I’d never heard of Velvet Finishes, definitely gonna run out and get some, tho. I have a dresser I’m going to upcycle in to an TV stand/entertainment center for our living room, another HEAVY piece that’s staying in place for good once it gets moved, ha! I think I’ll have to try out this paint on it. I LOVE your pop of red, Jenna, SO CUTE! OMG how have I never heard of this product?? I love to refinish furniture and I have an old hutch and a twin headboard and footboard id love to turn into a bench. These finishes would make bother pieces amazing. I would find a bookcase for my nieces room (maybe two) and redo them for her. I have a hutch with glass doors that could use a makeover. I would love to use on a nightstand I have. I have a lot of projects I could do but the first would be to makeover the small dresser I have in my dining room that I keep the cat supplies in. I wsould paint my entry way table. We’d like to touch up the kitchen with a dull yellow. I would use it on my cabinets in my kitchen. They need a much need paint job. I would use Velvet Finishes and O’verlays on an old chest of drawers I’m refinishing. What a nice accent color. Red tones are VERY hard to find without it seeming like I’m decorating for Valentine’s Day or Christmas. I love this hue! My family does a lot of garage-sale hunting for old pieces of furniture that need a little love. This would look great on an old curio cabinet, except the one I have does not have glass. Great overhaul! I would like to refinish a cabinet in the kitchen. I actually have a shelf JUST like that one! this totally gave me inspiration!! I would dress up an entertainment center that is boring boring boring! hahaha! Lord, I love Reba and Lorrie. And really all female country singers that were big in the 90’s! haha! Thanks, Jamie!